This volume explores the process of heritage making and its relation to the production of touristic places, examining several case studies around the world. Most existing literature on heritage and tourism centers either on its managerial aspects, the tourist experience, or issues related to inequality and identity politics. This volume instead establishes theoretical links between analyses of heritage and the production and reproduction of places in the context of the global tourist trade. The approach adopted here is to explore the production of heritage as a complex process shaped by local and global discourses that can have a deep impact on several policies and legislations. Heritage itself has now become not only a global discourse, but also a global practice, which may eventually lead to the use of heritage as a field for hegemony. From these perspectives, heritage making may be incorporated in the world economy, mainly through the global tourism trade. The chapters in this book stress the need for identifying the intrinsic political implications of these processes, relocating their study in political, economic and social settings. 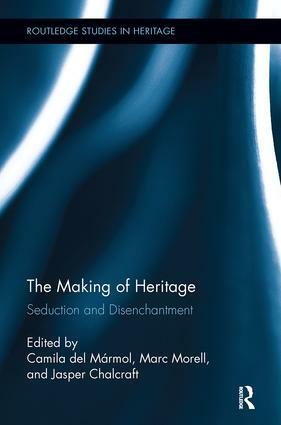 Combined with a diversified set of theoretical approaches and research methods, guided by a common thematic rationale, The Making of Heritage is at the forefront of current debates about heritage. Camila del Mármol works as a Professora Associada at the University of Barcelona, Spain. She has pursued ethnographic research in the Catalan Pyrenees focusing on the development of heritage processes. She is the author of Pasados locales, políticas globales. Procesos de patrimonialización en un valle del Pirineo catalán (2012). Marc Morell works as a Professor Associat at the Universitat de les Illes Balears, Spain. Besides his affiliation to various associations, he is actively involved in the Política, Treball i Sostenibilitat research group at the Universitat de les Illes Balears and the Observatori de l’Antropologia del Conflicte Urbà at the Universitat de Barcelona. Jasper Chalcraft is Visiting Research Fellow at the University of Sussex, and Honorary Research Fellow at the University of Leicester, UK. He has conducted fieldwork at three World Heritage rock art sites, in alpine Italy, central Tanzania and south western Libya. He is currently project manager for the CHaP (Cultural Heritage and Peacebuilding) project in the University of Leicester's School of Archaeology and Ancient History and a Visiting Lecturer at the Università degli Studi di Scienze Gastronomiche, Italy.